The news that North Korean leader Kim Jong Un would meet with President Trump has strained the prodigious capacity of the Trump Resistance to debunk his accomplishments. Anti-Trump journalists who don't know anything about war in general, and specifically very little about the deployment of forces in the Korean Peninsula, have been shrieking from the rooftops of America since the election that Mr. Trump was capable of blowing up the world in Korea. 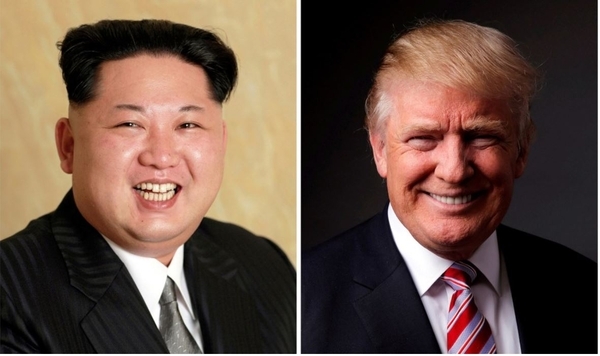 The Washington press and the international community had uniformly predicted the complete failure of President Trump's policy of escalating pressure on North Korea. Led by a self-satisfied Vladimir Putin, they smugly assumed that the total failure in this area of the Clinton, George W. Bush, and Obama administrations would continue: The world would uneasily welcome North Korea to the nuclear club and the Washington press would conduct a stentorian rain dance of celebration at American impotence and Trump foolishness. On the announcement of the impending meeting, the consternation of the rigid Trump Resistance took many forms. One Democrat lamented that "Trump's bluster, unfortunately, has succeeded." The inimitable Max Boot, a legitimate authority on many strategic subjects, as long as President Trump isn't involved, hooted that MR. Trump had been hoodwinked by both Koreas. Others warned darkly that either Mr. Kim would swindle the American president in the negotiations, or, having achieved the great feat of meeting a U.S. president, would blow up the talks with no useful result. There was also the snide comment that it would be an encounter between two madmen and nothing useful could come of that, and widespread bemoaning of the absence of an agenda and the haste of the meeting. Many warned that Mr. Trump would virtually have to be carried into and out of the meetings by his senior military and diplomatic advisers to protect him from himself, as well as from the guile of the sly totalitarian hermit from Pyongyang. One distinguished exception was CNN's Erin Burnett, who made the point that if the president succeeded in his objective of denuclearizing North Korea (a possibility no one else in the anti-Trump press even acknowledged to be possible), he would be recognized as "a great president." Donald Trump is the last hope of the nuclear anti-proliferation regime, in honor of which President Obama famously promised in Prague in 2009 to ensure that Iran and North Korea would not become nuclear powers. If those countries do become nuclear powers (and Mr. Obama did nothing to prevent that), so eventually will dozens of other countries. The only reason that these talks will take place is that President Trump's forceful diplomacy has convinced China, which has convinced North Korea, that if its attempt to become a nuclear power does not stop, the United States will prevent it militarily. This can be done in one minute with a cruise-missile and precise-bombing attack on the relatively few military targets North Korea possesses, including the artillery aimed at the great metropolis of Seoul in South Korea. There would be relatively few casualties and every militarily knowledgeable person in the world knows it. Accordingly, the North Korean leader has opted for a solution somewhat like that of the Cuban missile crisis in 1962. He can have an assurance of no attempted regime change, the removal of American nuclear forces (but not conventional forces) from South Korea, and a relaxation of sanctions, in exchange for an ironclad and inspection-verified demilitarization of his nuclear program. There won't be any negotiation when they meet, just a signing of a pre-agreed arrangement. Otherwise there will be no meeting, and if Mr. Kim doesn't come to his senses, he will be finished by the U.S. Navy, and China's nightmare of a united Korea will become distinctly possible. The avalanche of fretfulness over Korea followed the outburst of rather exaggerated concerns about a trade war because of the president's imposition of tariffs on steel and aluminum, with many exemptions starting with Canada and Mexico (which are in the midst of the NAFTA renegotiations with the administration). The world could have done without the president's customary histrionics, including the assertion that trade wars are good. The fearful, extending in this case even to the normally relatively unflappable Wall Street Journal, are incapable of recognizing the effectiveness of President Trump's negotiating techniques. Most of them were also alarmed at his exchange of polemics with the "rocket man" whom he reminded that he had a smaller and less reliable "nuclear button" than does the United States. Too much significance was attached to the departure of the president's chief economic adviser, Gary Cohn. He allegedly almost quit last August over the outrageous misrepresentations of Mr. Trump's comments following the Charlottesville riots, and as a Wall Streeter and registered Democrat, he was always an exotic, though certainly a capable, team member. But he is hardly irreplaceable. There was a reprise of the familiar claims that the administration is in disorder. The annoyingly imperishable Carl Bernstein made the rounds again with his theory of a constitutional crisis because of the inability of the administration to function and the mental incapacity of the president. Fortunately (though 45 years late), no one is listening. There will not be a trade war, and Mr. Trump's conduct to date of the NAFTA negotiations shows that he is seeking improvements in America's trading status and is not a protectionist. The frequent references to the Smoot-Hawley Tariff of 1930 are nonsense; it was a foolish measure but it had little to do with the Depression, which after the crash of the equity bubble in 1929 was aggravated by raising taxes and shrinking the money supply, the worst possible policy prescription. At that time, trade did not account for more than 15% of American GDP. The present $800 billion annual trade deficit is an outrage and the half-measures proposed by those wringing their hands over any tariff increase will not do the necessary. It is a myth of liberal globalists with incandescent consciences and a poor sense of arithmetic that we are approaching a trade war. What we are approaching is a stage-by-stage reform of existing American trade arrangements that sharply reduces the ability of foreigners to export unemployment to the United States. In a sense, the splendid and always fair-minded Peggy Noonan has identified the problem. She, whose career in the White House was spent with one of its most chivalrous and gentlemanly, as well as most successful, occupants, Ronald Reagan, finds it difficult not to consider MR. Trump's administrative and public-relations techniques "crazy." She acknowledges that the president is rather successful and that most of his policies are sensible, but admits with reluctance to being among those who fear that his "crazy" methods will not ultimately succeed. They are not crazy, though, even in a week where by Tuesday morning the majority of the House Intelligence Committee had pronounced the death of the Russian-collusion illusion and the secretary of state had been sacked in favor of the CIA director (a likely improvement). Mr. Trump's methods are a novel form of creative tension that keeps him constantly as the story, and they have succeeded exceptionally well in Donald Trump's pre-presidential career. The little-noticed fact is that in making billions of dollars, including an astonishing comeback from financial disaster, becoming an instant television star and commanding an audience of nearly 30 million people for 15 years, in transforming celebrity into such political power that he is the only person in history elected president without ever having held any government or military position, Trump achieved more before he was president than any previous holder of that office except Washington, Jefferson, Madison, Grant, and Eisenhower. It is easy to lose sight of that. His methods, including his recourse to social media, have been successful. No president before FDR used the radio or the airplane, met the press regularly, or even smiled much. The office evolves and is what its occupant makes of it.